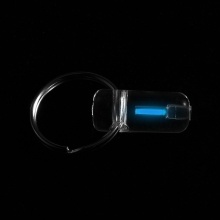 This key ring with tritium gas tube inside which is self luminous and beautiful in the dark. It is a great decoration to attach to your backpack, key chain, belt loops. Tritium gas tube inside, self luminous, bright and visible in the dark. Long life span, glows continuously for 15 – 25 years. Super strong acrylic housing, waterproof and shockproof. With a ring to attach to your backpack, key ring, belt loop, etc. Compact and lightweight, no external power required, very easy to use.